iWeb Hosting Review 2019: Is iWeb Hosting a Good Hosting? iWebHosting is a hosting company established more than 15 years ago. It has a significant presence in Brazil as well as in the United States. The vendor offers shared hosting, VPS resellers, and dedicated server solutions. 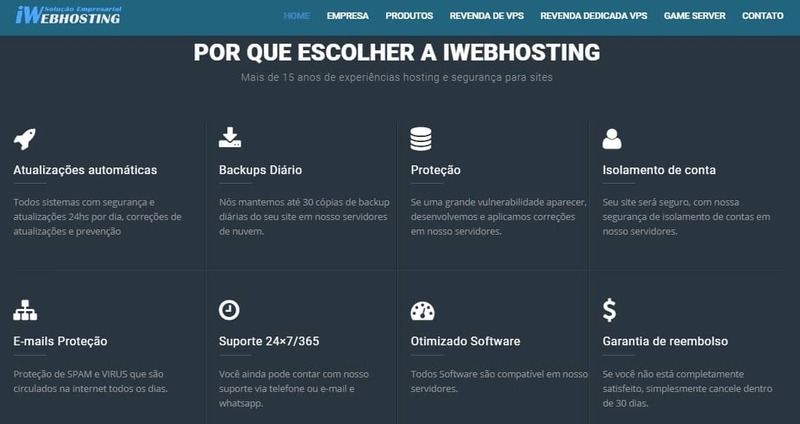 iWebHosting, not to be confused with the Canadian-based iWeb that offers IT infrastructure solutions under its website iWeb.com, is a hosting vendor with a significant market share in Brazil and the U.S. The hosting firm offers premium hosting solutions including shared hosting, VPS, resellers, and dedicated servers from its two data centers located in the U.S and Brazil. The iWebHosting website is available in English, Portuguese, and French. iWebHosting has two server locations: in Brazil and in the United States. The company is always updating its data center facilities to offer the best hosting services as new technology keeps on evolving. It’s data centers house KMV servers providing secure bios level access and full control of servers and network devices. The servers are compatible with most software, and use both Linux and Windows OS platforms. What’s more, its VPS solution includes WHMCS, Complete API, and cPanel control panel. iWebHosting offers a wide range of hosting solutions that can get you confused. It classifies its packages based on the OS used (either Windows or Linux) and based on the control panel in use (either cPanel or Plesk). However, the features included are hardly any different from one plan to the next. Nevertheless, the vendor has also designed a special solution for gaming websites. Its Cloud Game Server solution is designed by its programmers who understand how to design the perfect server for gamers. The most basic gaming plan from this vendor includes Intel (R) Xeon (R) CPU E5606, CPU Guaranteed (GHZ) 1x 3.70, 20GB disk space, 1GB guaranteed memory, one dedicated IPv4 IP address, and Cisco 5520 protection, among other features. iWebHosting provides automatic updates of all its systems. It also offers automatic daily backups to all its hosting clients. It keeps up to 30 backup copies of your website, and with just a few mouse clicks, you can fully restore your website data in the event that you lose it following a disaster. iWebHosting offers an uptime of about 99.9%. Information about the latest availability stats is available on its website. If you put into consideration this vendor’s time-tested uptime, and the array of features it includes in its hosting plans, it would be fair to say that its hosting plans are relatively inexpensive. What’s more, unlike other vendors that have attractive first-time rates but many other hidden charges, iWebHosting has straightforward pricing with no hidden costs. The vendor offers only month-to-month billing cycles. Its hosting prices are listed on its website in Brazilian real. For first-time customers unsatisfied with its services, the vendor allows for free and simple cancellation with its 30-day money-back guarantee. You can contact the customer desk via telephone, email, live chat, and ticketing system. The efficient support desk is available 24/7/365. That said, the vendor’s live chat support does not seem very effective in getting users the help they need. I tried starting a conversation via live chat but did not get a response. The vendor sent a follow-up email almost 24 hours later asking for more information, but not quite answering any of my questions. While iWebHosting has a knowledge base on its website, it has less than 10 articles/tutorials. More than 15 years since iWebHosting started its operations, the hosting firm continues to grow its clientele not just in Brazil, but in the United States and a number of other countries around the world as well. The company continues to invest in state-of-the-art hosting infrastructure to deliver excellent hosting solutions to businesses of all sizes. Its special server solution for gamers makes it an appealing option to gaming website owners. Buy gaming server solutions at iWeb Hosting ! Wondering how iWeb Hosting stacks up against other Web Hosting companies? Enter any other Web Hosting company and we will give you a side-by-side comparison.